The annual Hope College golf outing, the “Bob DeYoung Hope Classic,” will be held on Monday, June 8, at Ravines Golf Club in Saugatuck. A 38-year tradition, the long-running event was renamed in 2000 for Bob DeYoung, who retired in June of that year as vice president for college advancement after working at Hope since 1965 in admissions, student development and advancement. DeYoung had been instrumental in establishing the outing. The golf outing’s format is 18-hole scramble with foursome play. Sponsored by the Hope College Alumni Association, the event is open to all friends of the college. Players may sign up as singles, in pairs or as part of a foursome. Singles and pairs will be combined into foursomes by the college’s Office of Alumni and Parent Relations. All foursomes will be placed in one of four divisions based on the team members’ average 18-hole scores. To accommodate players, there will be two shotgun starts, at 7:45 a.m. and 1:30 p.m. Registration for the morning begins at 7 a.m. and includes breakfast before the round and a lunch at noon, and is $90 per person. Registration for the afternoon begins at noon and includes the lunch, and is $105 per person. Prizes for the golf outing are donated by corporate underwriters. The net proceeds from the event will be applied to the Robert ’56 and Marcia ’55 DeYoung Scholarship Fund at Hope for students pursuing teacher-education studies. Since 2007, the event has raised more than $30,000 for the scholarship. Ravines Golf Club is located at 3520 Palmer Drive in Saugatuck. 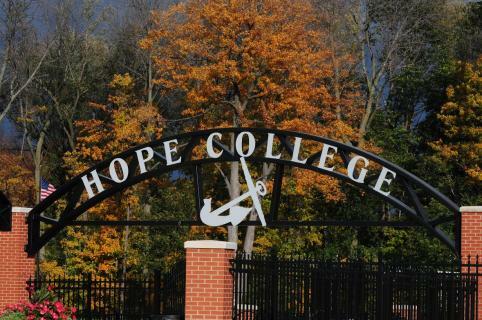 Collin Breit of Muskegon, Michigan (Western Michigan Christian HS), and Jenna Grasmeyer of Jenison, Michigan (Hudsonville Unity Christian HS), were named the outstanding male and female athletes among Hope College graduates in the class of 2015. Dr. Graham Peaslee of the Hope College chemistry faculty has received a second major grant from the U.S. Department of Energy to create a system for doing some recycling at the atomic level. Hope College junior Claire Schaar of Fremont is one of only 15 undergraduate students attending colleges or universities in the United States and Canada to receive a Travel Award from the Genetics Society of America (GSA) to attend the 20th International C. elegans Meeting to present research findings.